Manipur is a small state – a tiny fist-shaped area on the Indian map. The bond within and between the people living here and the community is also clenched tight like a fist – a strong bond at its most positive, though more like a prison at its most negative. 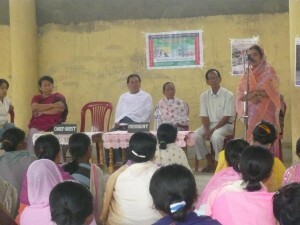 The individual is an important part of the community and grassroots community-based institutions – such as that of the village council, the panchayat or, in the context of the more urbanised parts of the state, the local clubs – have a major role in the upkeep of social order and traditional values. They are also empowered to give punitive measures. In fact, social ostracism is considered one of the worst punishments that can be given to a person, given that the locality or community forms part of the identity of a person. That is why we place a lot of emphasis on targeting these institutions in our awareness campaigns, as well as involving them in our work, to ensure that women do not continue to be silent sufferers of violence and discrimination. In one of my previous blogs I spoke about a woman whose husband regularly beat her up. That day, this woman (let us call her Chaobi), had called us for help. She was having an asthma attack but her husband refused to let us take her to a doctor, so we had to call in additional help from the police and the Manipur State Commission for Women (MSCW). When Chaobi got to hospital we found that a few of her ribs were fractured as a result of the beatings that day. 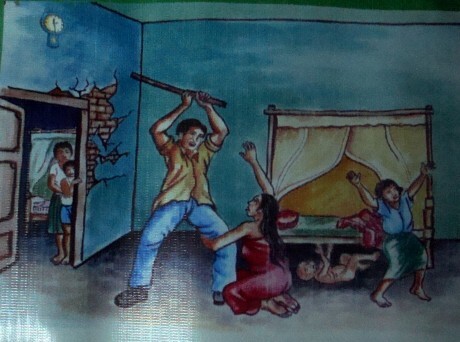 After the incident she refused to return to her husband’s house and instead stayed with her eldest son and his family who had moved to a rented room a few years earlier, fed-up with the father’s frequent domestic violence. However, Chaobi continued to receive abusive and threatening calls from her husband, asking her to move all her belongings from the house. He also allegedly told his daughter-in-laws that he was going to take a new wife. As he is from the same locality where I live, he used to make snide remarks and give me glowering looks each time I walked past him. As I have been working in this line for some time now, I am used to such things. But we thought that there should be better protection for Chaobi. So we approached the local club. This is an organisation formed by the people of the locality where Chaobi and her husband lived together, and as I mentioned earlier they have a major role in the upkeep of the locality – from clean sewers to social order. We explained to them the gravity of the situation and asked them to intervene in the matter. They also asked both sides to give their statements. In her statement Chaobi also told them that she had given her blood and sweat to build and maintain the house where she and her husband lived in. She said she wants to stay there as she also has full rights to it. On their part, the club elders and members were very co-operative (we had conducted a few sensitisation programmes with them previously) and said that they would try their best to see the broken family reunited. From our side, we could have helped Chaobi file a case in the court and seek a protection order against her husband. But in a place like Manipur, where the police are more concerned with the conflict situation, how will a piece of paper ensure that Chaobi is protected? It is the people in the locality, her neighbours, and the local club who will be the first to get wind of any wrongdoing and rush to her aid. If we succeed in sensitising these important stakeholders and invigorating them to take positive action, then half of our work is done and women like Chaobi will be free from violence. 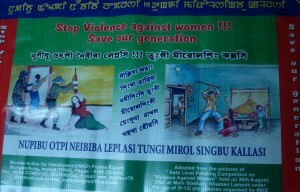 Domestic violence is also a huge problem in my area due to heavy drinking at weekends.